How To Choose A Best Sleeping Bag For Extreme Cold Weather? While most people enjoy camping in spring or summer, others like me would love to answer for the calling of nature even under the extreme weather in winter. As you might guess, sometimes the experiences aren’t exactly happy. Most of the time, I often caught myself in the middle of the cold freezing from head to toes. There was a point I thought I must quit my hobby for outdoor adventures. Fortunately, last spring, I decided to give it another try. After months searching for the best extreme cold weather sleeping bags, I finally picked up the one I need. Thanks to this experience, I have accumulated a wealth of knowledge about this product, and I want to share it with people who are facing the same problem as mine. In this article, you will find a list of six best extreme cold weather sleeping bags and guidelines on how to choose a suitable sleeping bag. Hyke & Byke Goose Down Sleeping Bag for Backpacking was the first sleeping bag I found impressive. I go with this one first because of the brand. If you are a frequent camper, you must have heard of Hyke & Byke. Though they don’t offer a wide range of products for outdoor activities, their tents and sleeping bags are prized for being durable and reasonably priced. Hyke & Byke Goose Down Sleeping Bag is not an exception. While many companies choose to lie about their products, claiming their sleeping bags are lightweight even though they aren’t, Hyke & Byke is one of the rare kinds that you can rely on. This goose down sleeping bag is exceptionally lightweight. The weights vary from 2.89 lbs to 3.24 lbs. I got a friend hiking 10 miles in the Allegheny national park with this bag with ease. Hyke & Byke Goose Down Sleeping Bag offers a temperature rating of 0°F – among the lowest possible in the market at the moment. Thanks to the 800 fill-power premium goose down, you can stay pleasantly inside the bag even the temperature is extremely cold. This is one of the best cold weather sleeping bags in the market. Those frequent winter campers who look for an affordable yet durable sleeping bag should definitely go for Hyke & Byke Goose Down Sleeping Bag. Lack of draft collars will probably result in escaping hot air. Outdoor Vitals Summit 0°F Premium Down Sleeping Bag is considered a reasonably priced sleeping bag. I was impressed by its lightweight at first. The compressed bag weighs only around 2 lbs, which will make the trip whole lot easier since you don’t feel like carrying it at all. The 800 fill-power duck down contributes to the toasty warm even when the temperature gets down to 0°F. Down insulators are also well-known for its durability and usability so that you don’t have to worry too much about buying a new sleeping bag any time soon. 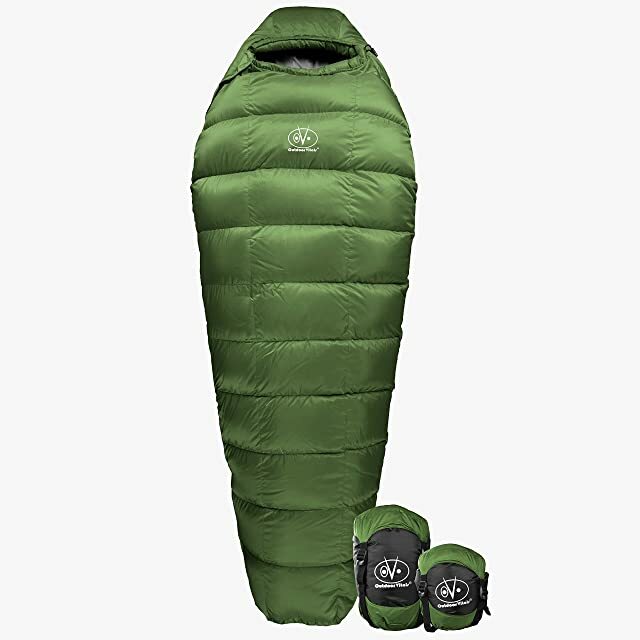 Outdoor Vitals Summit 0°F Premium Down Sleeping Bag adopts the mummy shape, which does a great job at trapping the heat inside, keeping you toasty all night. The zippers are snag-free, eliminating any problems that typical sleeping bags have. The drawback here is the lack of draft collars. If you move too frequently at night, chances are a significant amount of hot air will escape outside. Among hundreds of choices, Outdoor Vitals Sleeping Bag is a real bargain given its price and features. Due to the shortcoming, I would recommend this sleeping bag for short camping trips at the beginning of winter. Those who want to stay on their tight budget could give it a try too. In case you opt for regular winter campings and hiking, you may want to look for lighter sleeping bags. Check out the ultralight backpacking sleeping bags here. If you ask me my opinion about those who spend over $400 just for a sleeping bag months ago, I will say they are all nuts. It is the Western Mountaineering 10 Degree Versalite Sleeping Bag that changes my mind. If you have years of experience sleeping in low-quality sleeping bags, this bag can be a game-changing one. It’s worth every single penny. This bag offers a temperature rating of 10°F. When you do the calculation, it doesn’t seem to compete with those 0-degree bags. However, unless you are a big fan of freezing weather and opt for northern camping in winter, you may not need a 0-degree bag. Western Mountaineering Versalite would be an excellent three-season sleeping bag, which you can use for spring, autumn and winter. By the way, if you want a suitable sleeping bag for summer, you may want to take a look at Best Sleeping Bags For Summer for recommendations and tips. Zippers are sometimes nightmares for sleeping bag users. Poor-quality zippers often snag on the extra fabric, or sometimes the teeth won’t match. The zippers of this sleeping bag are the best; you won’t even encounter any problems zipping them up and down. Things I don’t like about this bag? It could be the lack of a foot-end loop used for hanging the bag. I would love to hang my bag up when the sun is there. Other than that, there is no problem with this bag. If you want to spend money wisely, spend it on Western Mountaineering Versalite Sleeping Bag since it is compatible for three-season campings. 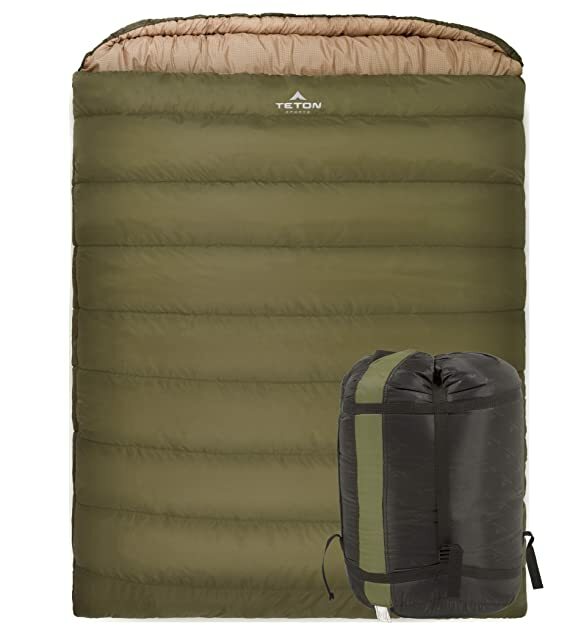 The Teton Sports Mammoth Queen Size Sleeping Bag offers a ton of features that keep you away from the bitter weather outside. This bag adopts what’s called SuperLoft Elite™ Hollow Fiber Fill, which is an excellent insulator for heat trapping. Plus, the use of offset seams will prevent any cold spots that may appear when you slide around too often. This bag provides adequate warmth. I wouldn’t recommend you to wear too many clothes inside the bag. Otherwise, you have to put your legs or arms out from time to time. As for the inner lining materials, this bag use flannel. The inner lining is exceptionally soft and cozy as you can imagine. Flannel can produce warmth and comfortability, which is, of course, an excellent material for a sleeping bag. And flannel doesn’t keep odors, so that you can let your friends borrow it without problems. The Teton Sports Mammoth Queen Size Sleeping Bag comes with a stuff sack. While it offers straps to secure the compressed bag, putting the folded bag into the sack is a daunting task. You may get used to it after a few practices, but not so many people like the idea. Due to the weight of this bag, around 16.5 lbs when packed, it is ideal for camping trips by cars. 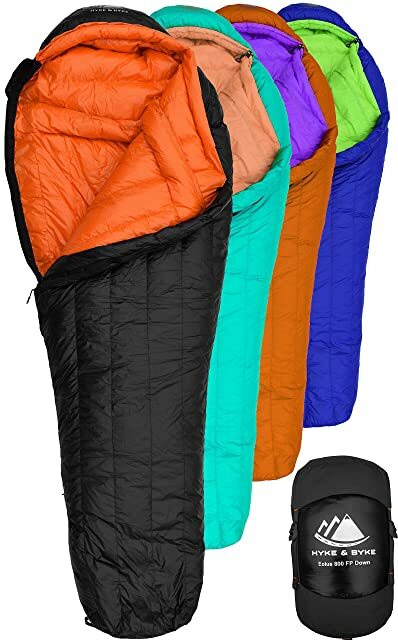 If you are a couple looking for double sleeping bags for overnight camping trips, the Teton Mammoth Queen Size Slepping Bag is quite a choice to make. When choosing winter sleeping bags, it is essential to look at the temperature rating. 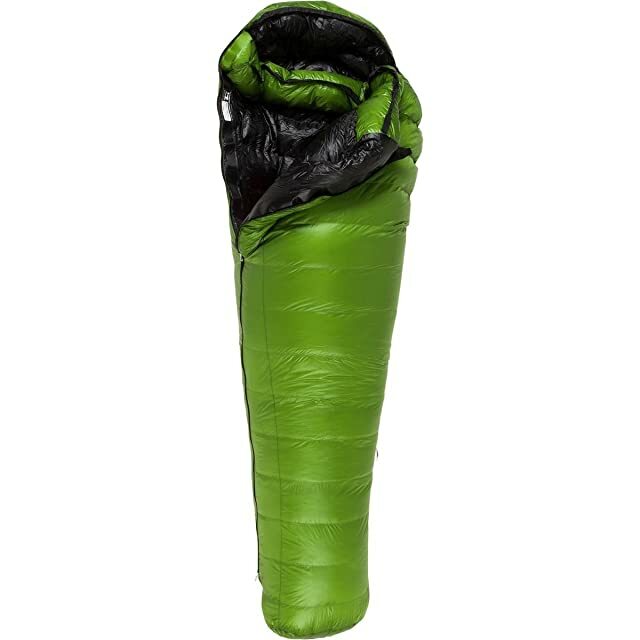 Teton Sports Tracker Ultralight Double Sleeping Bag offers a rating of +5ºF. The rating implies that you can sleep comfortably when the temperature is more than +5ºF. Thanks to PolarLite™ Micro Insulation and the dual-layer construction, the bag can deliver substantial warmth through the night without creating any cold spots. This mummy-shaped double sleeping bag also offers extra room to stay warm and adjust sleeping positions during the night. The dual zippers are brilliant ideas since they allow each person to get in and move around without disturbing the other. There is a problem with the extra space as some people find it quite loose, and cold air can easily get inside. What I like the most about this sleeping bag? Its lightweight. Indeed, no one wants to carry heavy loads on their backs. The total weight of this double sleeping bag is about 8.2 lbs. I have to say that this is nowhere near ultralightweight, but it is enough to make it perfect for outdoor activities such as backpacking or hiking. I know a lot of couples would appreciate Teton Sports very much for this double sleeping bag since it comes with an affordable price. I think this double sleeping bag is more suitable for those who camp not so frequently and aim only for short overnights. Check out best budget sleeping bags if you want to find out more options for your camping trips. So what do you have to consider when you want to buy a good sleeping bag? Here are some few tips for you. Because sleeping bags keep you warm in extreme weather, the size must be bulkier than other sleeping bags in general. That say, you are supposed to pick a right size for yourself. You shouldn’t choose something too big for your body as it could reduce insulation during your sleep. On the other hand, sleeping bags which are too tight could be a bad idea for people with claustrophobia. Most sleeping bags are designed for men and women separately due to body shape. Sleeping bags for women are always with narrow shoulder while shoulder girth for men would be larger. The size depends on manufacturers too. Thus, you can take a look at the product specs to see what person height is acceptable to use. Design can tell a lot about the sleeping bag, especially with sleeping bags for super cold weather. To keep insulation and comfortability inside while users can move in or out, you have to check a bunch of details. Shape: Most cold weather sleeping bags are designed in mummy shape to offer your body the fullest insulation. If you want to find a couple sleeping bag, you should opt for a bag with 2 hoods. Hood: the hood with drawcord can help you to keep heat stay in or out as you wish. It works like a pillow too. But test it before you might choose a shallow hood. Zipper: Zippers on the sides with draft tube (a tube goes along with zipper and seals zipper coils) will allow the bags to retain heat. Besides, wide cut on side is recommended for winter sleeping bag. The entrance seems to be easier to get in than the middle cut. Material is the top concerns if you are looking for a good sleeping bag. Two popular fills now are down and synthetic. Down can help you to stay warm better with the same fill as synthetic, but release heat faster when it gets wet. Synthetic fill, conversely, can get dried faster and keep warmth while being wet. Some sleeping bags are made of from both: down on top and synthetic in bottom. It seems the down fill is the most favorite for winter due to its amazing insulating ability. Duck or goose down fill perform differently, and it matters in the cost. 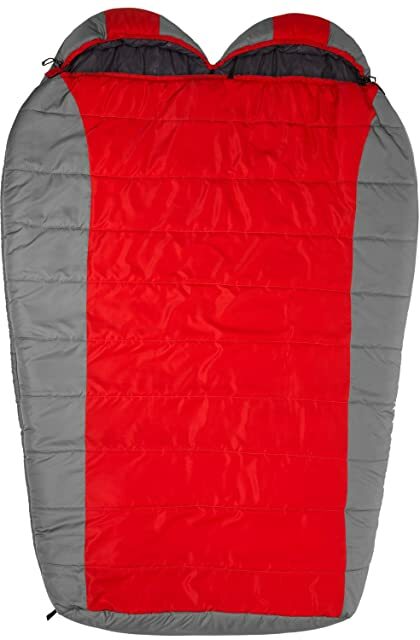 With high quality down fill, the sleeping bag can keep you warm with outside temperature of under 10 F. In these cases, the fill power is usually 800 – 850. For synthetic fill, you might expect a heavier sleeping bag, and you might pay less but carry a bulky bag with you on a picnic. To find a good sleeping bag for winter night, you should prepare to spend some extra cost of high-quality down fill. If you are interested in more affordable ones, you can find some recommendation in another list for your budget. You should consider a bag with water repellent down (or DRW). Then you can be safe against wet snow or snowmelt or survive in a high humidity zone. Moreover, other small details such as footbox, pad loops or stash pockets will assist you the best during your sleep. You should care for your feet the most. Some sleeping bags offer users a Trapezoidal footbox to keep their feet warmth. To cover your trip in winter, you should prepare a good sleeping bag which can keep you safe and sound from the freezing temperature, but convenience and all-weather compatibility will be the best one. My list of the best extreme cold weather sleeping bags will certainly give you an idea or two about which bag is the most suitable for you.